Over Thanksgiving break, my 10-year-old daughter had foot surgery. She has a condition called Accessory Navicular Syndrome, which basically means she has an extra bone in each foot. We always knew she was special! The condition itself isn’t super rare, but the size of her extra bones are unusually large. After the surgery, the doctor told us it was probably the biggest accessory bone he’s ever seen, including all of his adult patients. The condition results in the tendon being connected in the wrong place, which has caused her a fair amount of pain and repeated injuries. She had to quit gymnastics, but it’s not in her nature to curb her naturally athletic tendencies. She decided to opt for the surgery to get it taken care of, so that she’ll be able to play sports in junior high next year. She’s been super tough through the entire experience thus far. She rarely complains, and her naturally high pain tolerance certainly helped this whole process. She was very matter-of-fact about it all, even watching the anesthesiologist insert her IV before being wheeled into the operating room. The doctors and nurses were fantastic. They even let her bring her pillow pet into the OR with her. She said the surgery wasn’t as bad as she expected, and she’s in very little pain, rarely asking for the occasional Advil. I think the hardest part of it is being on crutches for a month. She was in a splint and bandages for the first week, until the swelling went down enough for a hard cast. 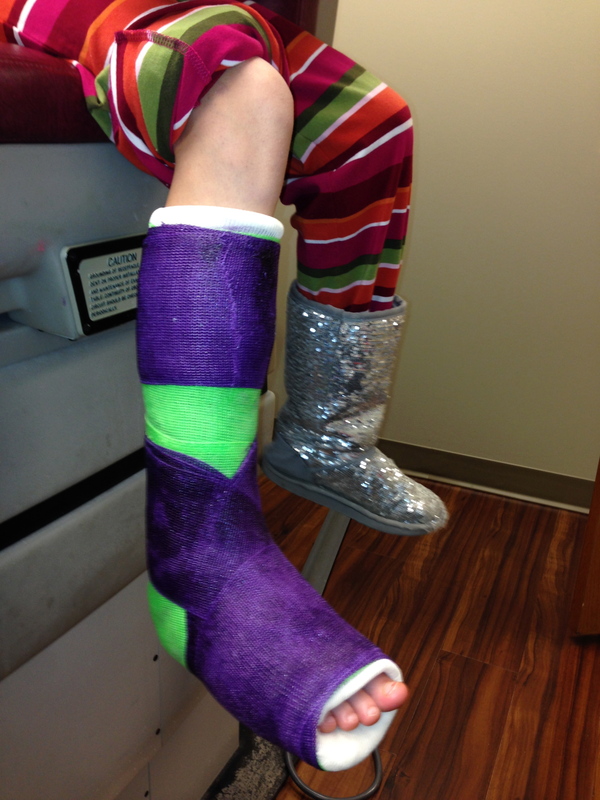 She asked the doctor to make her hard cast purple and lime green, and he was happy to comply. 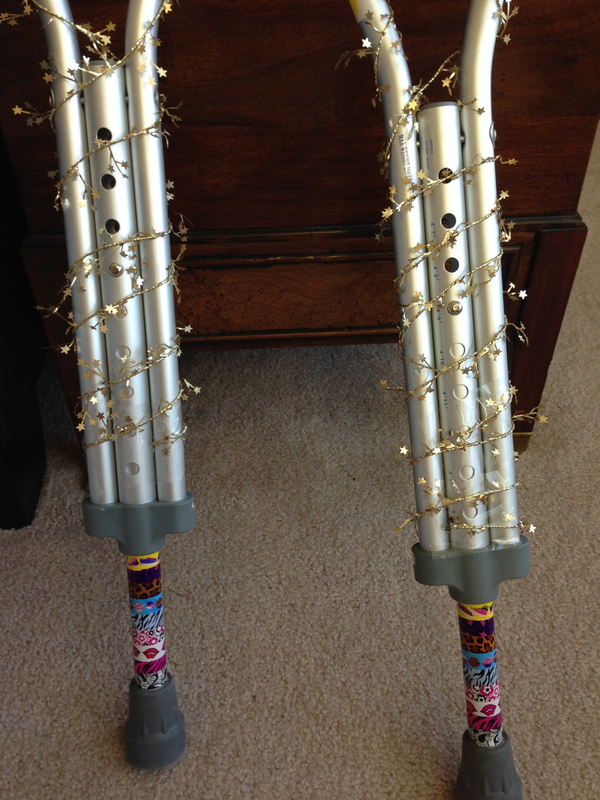 Friends have signed her cast in silver Sharpie marker, and she’s decorated her crutches to make them quite the sparkly accessory. After she gets her hard cast off in a couple of weeks, she’ll wear a boot cast for another month or so after that. She may also need to do physical therapy. I’m learning that navigating in the rain and snow on crutches can be very nerve-wracking. She’s already fallen twice, which was pretty traumatic for both of us. She’s doing great, but unfortunately we’ll have to do it all again. The plan is that we’ll likely follow up with her other foot in about three to six months, after she’s had a chance to fully recover from this first surgery. What a brave little pumpkin! Sending all good thoughts for a speedy and painless recovery for this fix and the next. And ample patience for all. I have to have surgery for that too so I am glad to read this and hear that it isn’t very painful! My daughter said it wasn’t painful, but she does have an unusually high threshold for pain. She eventually got annoyed with the crutches and cast, but she didn’t hesitate to schedule the second surgery on her other foot right away. Within about three months, she was fully recovered and back to normal activity – jump roping, ice skating, etc. We’ll be going in for the second surgery in a couple of weeks. I hope you recover quickly from your surgery! My daughter is a gymnast and has been in pain since June. We are doing physic therapy but its so bad right now that she can’t walk. We were told they don’t want to do surgery but she is an athlete and does gymnastics, dance and basketball. I can’t understand why they don’t want to operate and instead have her in pain and giving up the sports he loves. Wondering if I need to get another opinion. It certainly never hurts to get another opinion. Good luck. I know how difficult it can be to see your daughter in pain. My 11-year-old gymnast daughter just had this done today. She had foot pain even walking, especially on uneven ground since her feet weren’t stable (she did surprisingly well at gymnastics, considering). I hope your daughter continues to do well with her feet. We have 6 months of this to go through, but reading about your daughter’s success helps. Mine is already up on crutches raiding the pantry. Did she go back to gymnastics? Yes, she did. She’s also dancing, surfing, swimming, and scuba diving. I’m glad to see a success story on a young girl. My daughter is 11 and we going through the process of decisions for what to do to help her. She went from training 6 days a week in MMA, to barely making it through one class a week without pain and discomfort. Originally she was injured in class when a hip toss throw went off centered and a large adult landed on her foot. She was told it was a bruised bone in her foot, given crutches and told to stay off of it. After weeks of no improvement and a second doctor visit, we were told that she needed to get back on her foot and work through the injury. Long story shortened, we moved to a new state, new doctors and more opportunities for her to train. After having an MRI done to confirm the diagnosis of accessory navicular with inflammation it’s been left in our hands to decide what the next step is either surgery or constant pain medication and rest if she decided to be active daily. My question is about the recovery time from surgery, I have read stories about months of lingering pain but only from adult patients and was wondering if a kid heals faster and stronger? Or is it based on courage and tenacity, wanting to get better and be normal again? Also did anyone discuss with your family the possibility of future surgeries should the symptoms come back? Or is it a one time fix all for life? I appreciate your time and hope your daughter continues to live a full happy life. Kristin, good luck with your daughter’s decision. Kids do heal amazingly quickly. My daughter had the surgery on the second foot three months after the first surgery, and she was fully recovered within three months of each surgery and back to her normal activities. She claimed it wasn’t painful after the first week or so, but she has an unusually high tolerance for pain. She only took a few painkillers those first few days after surgery. She was annoyed to be on crutches for weeks, but it’s important to the healing process. Unfortunately, there’s no guarantee that it’s a lifelong fix. One of the accessory navicular bones did grow back on one foot. The doctor said she just happens to be one of the unlucky few, and it doesn’t happen to everyone. We were so disappointed. It’s not as big as it was before, and it doesn’t cause her as much pain as it did before, but it is noticeable. We haven’t done anything about it as of yet, as she seems to be managing fine with it at this point. She’s 13-years-old now. Thank you Lisa for your reply. I was also wondering if shoe inserts were suggested for your daughter? Or custom insoles before and after her surgeries? If so, did they help minimize discomfort in everyday activities? Our doctor suggested that we might try shoe inserts before attempting surgery, to see if it might provide some comfort. My daughter wanted to go straight for the surgery option though. We never tried the inserts.